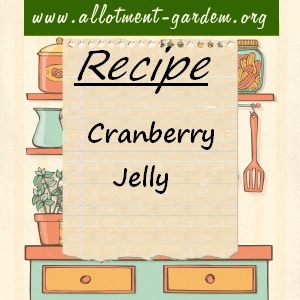 Cranberry Jelly is the traditional accompaniment to the Christmas Turkey. To make it really special, put some jelly into an ovenproof dish and warm slightly (we use the microwave on low for a few seconds) then mix in a little brandy. Wash and drain the cranberries. Put the fruit into a pan with the water and bring to the boil. Stew until the skins have broken. Turn into a jelly bag and leave to strain for 3 to 4 hours. Add lb (450 g) warmed sugar to each 1 pint (600 ml) of juice, stirring until the sugar has dissolved. Love your recipes they are a great help. 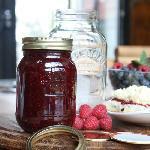 Can you add alcohol to jam recipes or just to jellies? I’m sure you can add alcohol to anything! 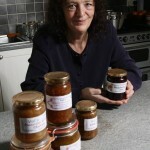 I use it a lot in marmalades in the proportion of 1 tablespoon to each 1 lb. Consider the temperature that you are adding it to. The alcohol will be burned off, just leaving the taste. Thankyou Val, I take it I add the alcohol at the end just like when adding whisky to marmalade? Thankyou for taking the time to answer and explain to me. Yes, that’s right, at the end. 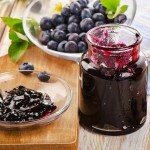 How do you test for pectin? Follow the link under the recipe. 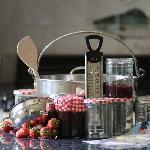 It tells you how to test for pectin and other finer points on Jam and Jelly making. Would just like to say thank you so much for the lovely Jelly recipes. Made my 2nd batch of Cranberry jelly today, to add to hampers for friends. I love the recipes on this site, I have tried quite a few of them now. Made the cranberry jelly today. I only had half a kilo of fresh cranberries though, so I only got enough jelly for a small jar… what a shame. Still, I love the taste and the colour!